Info "Use the plane to scrape down the wood. Something neat will happen!" Plane and Simple is one of Young Cricket’s Microgames in WarioWare: Smooth Moves. The name is a pun of the phrase "plain and simple". The player must pull the Wii Remote toward their self multiple times to move the planer down. 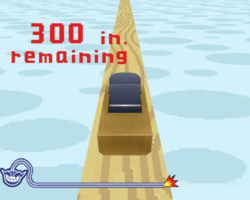 1st level difficulty: The player planes 300 units (inches) of wood to make skis. 2nd level difficulty: The player planes 6,000 units (yards) of wood to make train tracks. 3rd level difficulty: The player planes 9,999 units (miles) of wood to make the ring of the planet Saturn. This page was last edited on March 28, 2018, at 21:02.